"Please Don't Let Me Be Misunderstood"
The Labour DWP team, headed up by Rachel Reeves and Emma Reynolds did a great job in getting coverage of their headlines about an ‘astonishing’ rise in housing benefit claims by people in work. The message seemed a bit mixed to me, on the one hand pointing to an increase in poverty but on the other hand ‘bearing down’ not so much as on poverty or its causes, but the benefit bill. But the examples highlighted in the INDEPENDENT EXCLUSIVE - Croydon 1100% … Uttlesford 840%, Boston 103% weren’t really what one might have expected. 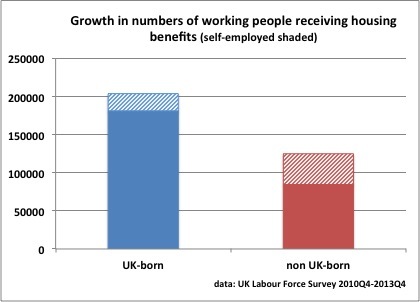 Unfortunately, no one responded to requests by me and others for the report, but I’d recently been comparing benefit claims level between employees and self-employed, and recognized the overall figures for claimant numbers and percentage change as much the same as results I’ve been getting from the UK Labour Force Survey. 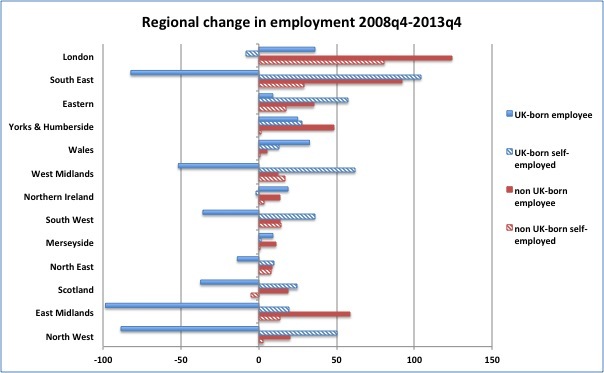 Now, having discovered as outlined here that a large part of the increase in UK self-employment since 2008 could be accounted for by migration, I wondered whether any part of the increase in housing benefit claims could possibly be related either to increasing self-employment or to migration. If this is where the ‘astonishing’ growth in claimant numbers has come from, not only does it beg the question of the impact of ‘bearing down’ on the benefits bill in this context, but what the growth actually means. Now it’s in identifying the migration aspect here (just as with the self-employed) that I don’t want to be misunderstood. The point isn’t about the impact or results of migration at all, but that recent and continuing migration might be obscuring what’s really happening in the labour market, and on the wider political landscape. Today we publish figures from the House of Commons Library which expose the complete failure of David Cameron’s government to control housing benefit spending because more people are struggling to get their pay to cover their rent. Following the last general election, Iain Duncan Smith said “we must be here to help people improve their lives – not just park them on long-term benefits.” Regrettably, that is exactly what his government has done because they have failed to tackle the cost-of-living crisis, housing shortage and growth of insecure and low paid jobs. So the clear implication is that IDS has failed to ‘help people’ as promised. But who were the people to whom he gave this assurance? It might be that more claimants means more people struggling to get their pay to cover their rent, but is it these people: has the housing benefit bill risen because IDS has failed in his promise to people in 2010 to help them improve their lives? If so, how much has the bill risen and/or how many has he failed? Well the answer certainly isn’t given by the reported figures. Again, it’s difficult to say without seeing the data itself, but it fundamentally matters how much of the growth results from people who were in work in 2010 starting to claim housing benefits (falling pay bad), and how much from people who were claiming housing benefits in 2010 starting to work (getting job good). The growth in claimant numbers needs to be disaggregated at least into ‘workers newly claiming’ and ‘claimants newly working’ and a comparison between or netting off of the two is needed for a meaningful result. This could affect the overall figures either way but as it happens, it looks as though they have rather inflated them, and even if the figures were disaggregated into the two groups of ‘workers newly claiming’ and ‘claimants newly working’ then migrants would inflate the first group and make IDS’s performance look worse, rather than the second and make it look better. The point is that either way it is distortive of the reality being purportedly represented. Whether IDS has helped as promised means looking at the people he made the promise to. The figures reported by Rachel Reeves and Emma Reynolds certainly aren’t any kind of proof that he hasn’t. This isn’t a party political point either. Another example is the repeated mantra of ‘more people in employment’, CCHQ’s Twitter avatar blinking ‘1.7 million new private sector jobs created since 2010’ at me several times a day. And coupled with strapline variations about you getting a pay packet and providing for your family. This too begs the question of who ‘you’ are supposed to be. Again the implication is that you who were suffering from Labour’s Great Recession have had new jobs created for you, giving you a pay packet and helping you look after your family. But a very significant proportion of the total increase in employment post-recession is comprised of growth among people born abroad. Likewise the issue of whether the recent growth in self-employment derives from opportunity or necessity is also largely predicated on the change occurring among a pre-existing group, and because the growth appears to have been significantly affected by the addition of new people to the group, an analysis that does not take this into account cannot properly examine change among the pre-existing group. Putting together ‘fog of war’ and ‘myths of migration’, I’m coining the phrase ‘mists of migration’. These mists obscure a clear view of what the landscape really looks like and how it might be changing. Certainly, looking at the group of people who would have been addressed by politicians in 2010 it looks as though nowhere near one and a half million of them have been made better off by new jobs. Nor do lots more of them seem to have become self-employed. 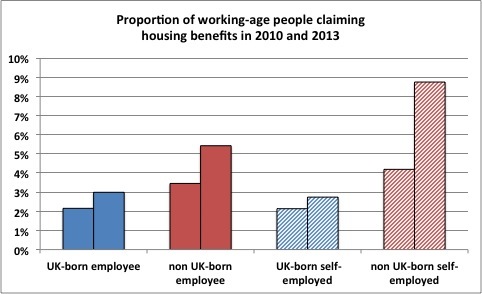 The increase in working housing benefit claims might or might not show many of them are worse off. Actually, whether looking at the working age population either in 2008 or 2010, the change in overall employment and self-employment levels between then and now haven’t been much like the headlines. This might explain why at the same time Government can be puzzled that their dramatic headline gains aren’t more appreciated, and Opposition that their own revelations of astonishing negatives aren’t more galvanizing. It’s not that they cancel each other out as if they were true they would instead be more likely polarizing. It’s that a large part of some of these changes – and on some issues maybe all of the change – just isn’t happening to the people being addressed. This is not to make any point at all about either migration or migrants, and recognizing too that place of birth is a broad brush, I do think it worth suggesting that this is an important and relevant factor to the extent and nature of change, and that greater clarity and understanding might result from taking it into account.